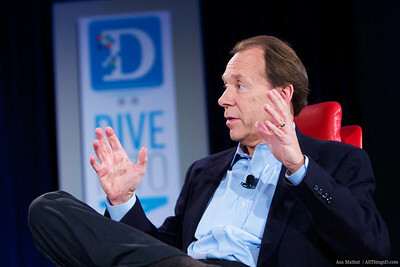 When Sprint CEO Dan Hesse joined the company three years ago, the third-largest carrier was bleeding subscribers from having a poor reputation for customer service and facing stiff competition from the likes of AT&T, which holds the exclusive on the iPhone. Since then, Sprint has stemmed the losses, mostly by beefing up its customer service and by investing in the prepaid sector to attract a wider audience during the economic downturn. Going forward, Sprint looks to its 4G strategy for growth through its ownership stake in WiMax-provider Clearwire. 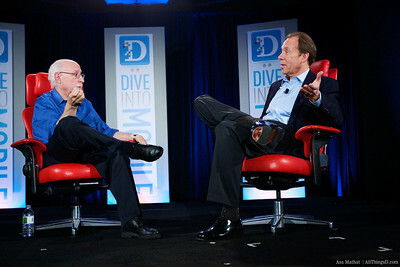 Next up, Hesse joins Walt Mossberg onstage. 3:45 pm: Walt welcomes Dan Hesse to the stage. 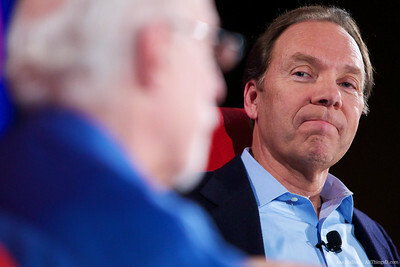 You can’t have mobile without networks, says Walt. You’ve led the way on 4G; tell us about it. 3:46 pm: Dan: We are getting San Francisco up soon, and will have 120 million POPs by the end of the year, or about a third of the country. He explains what 4G is: 3G for was email and Web pages, but 4G is for multimedia and video. The best analogy is that 4G is the wide open freeway vs. an interstate that provides the same speeds, but you have to stop along the way. 3:48 pm: Walt: Why are you using WiMax when the two other carriers are using LTE? Hesse: Back in 2008, we wanted to be first, and WiMax was available right now. (Lots to do with TDD, and other technical mumbo jumbo). Technically, there’s no difference. I can’t deny that LTE will be a bigger ecosystem, but we couldn’t wait. We thought the market was ready. With the success of the iPhone, we thought it was ready now. Walt: How much leadership did it give you? Hesse: Well, it made Verizon move a lot faster….In 2010, we’ll have 120 million POPs, and the EVO and Epic (two 4G phones) have been really successful. Hesse: If you were to go to Clearwire’s wholesale numbers, you should think of Sprint’s lion’s share of the wholesale numbers. Walt: Was it worth the investment? 3:53 pm: Hesse: 4G is one element of many. Walt: You like Consumer Reports, unlike the guy here earlier [AT&T’s Glenn Lurie]. Hesse: Sprint is the fastest growing brand of postpaid in the U.S.–not the Nextel brand, where we’ve been losing subscribers. 3:55 pm: Walt: Are you going to get the iPhone? Walt: Would you like the iPhone? Hesse: Under the right conditions, yes, I would. It’s a wonderful phone. 3:56 pm: Backing up a bit, Walt now asks about an industry trend toward tiered pricing for data plans, where the more you use, the more you pay. Sprint hasn’t yet limited users’ traffic. Hesse: Customers will pay a premium for simplicity. Even if it’s not in their best economic interest, they will go with the unlimited plan. We were the first to come out with truly unlimited text, voice and data with the Simply Everything plan. 3:59 pm: Walt: Are you not going to do tiered pricing? Hesse: So far, we aren’t, he says, which gets a round of applause from the audience. But Sprint did up the cost of the unlimited plans of the most capable devices on the network. 4:00 pm: Walt: Unlimited means unlimited or doesn’t it? Hesse: No, it doesn’t. What if they have the SlingBox streaming 24×7? 4:01 pm: Hesse: The trend is toward one plan for all of your devices, like tablets, phones, PCs, etc. Walt: Are you going to offer plans for all those devices? Hesse: We are thinking about it. That’s the next step to simplicity. Three years ago, it was about one device. 4:02 pm: Walt: People aren’t counting minutes, now they are counting megabytes and things people don’t understand. Hesse: Something has to give; what’s going to be the form? Do you have meters, do you have tiers, do you increase the price of the unlimited plans? Another option is to have a lot more spectrum available to add capacity at a lower cost. Walt: Are you talking about taking away the spectrum that the elderly use to watch their TV? Hesse: If more spectrum is available, you can use more frequencies, which is a lot less expensive than splitting cell sites and putting in more towers. Walt: There’s some confusion about Clearwire. They are opening stores and selling laptops and modems. You own most of that company, and they are building your WiMax network. Why are they competing with you? Hesse: I have a wholesale business that resells minutes to Leap, so it’s the same thing. 4:06 pm: Walt’s giving Hesse grief about the structure of the Clearwire deal. Despite Sprint owning roughly 54 percent of the company, Sprint doesn’t control the board. Walt: Who did that deal? Hesse: Two thumbs pointing at himself [me]. When you have this many owners of the company, we can’t agree. 4:08 pm: Walt: What’s the value of 4G? Hesse: The experience is really fast, and we offer unlimited plans on 4G. There’s a five-gigabyte cap on 3G, but 4G is completely unlimited. Walt’s curious if 4G is really life-changing and transformative. Sprint’s beating the other guys by 2x, not 10x or 20x. Hesse: My son showed me his speed test on his EVO at home, and it was over 8 mbps, so it depends. 4:11 pm: Questions from the audience. The Seattle Times’ Brier Dudley asks about the potential deal between Clearwire and T-Mobile, which may be falling apart because of Clearwire’s recent $1 billion in debt that it has raised. Hesse deflects the question despite several reports to the contrary, by saying he didn’t know anything about that. Another audience question: What’s your stance on network neutrality? Hesse: The FCC has come out with a proposal, and we are very supportive of it.